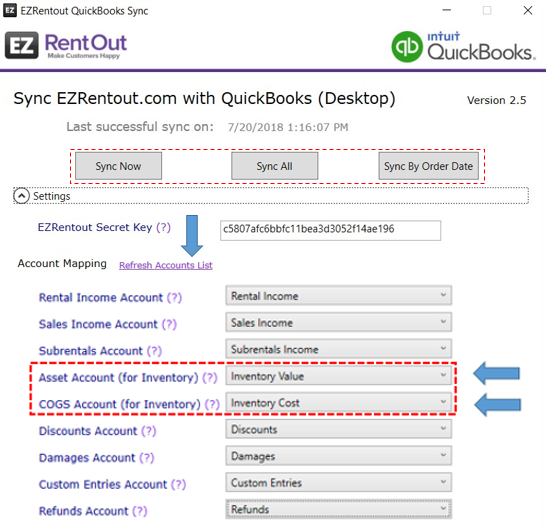 EZRentOut Sync enables you to quickly and effortlessly sync EZRentOut data (Taxes, Assets, Inventory, Asset Stock, Customers, Orders & Payments) with QuickBooks (desktop). 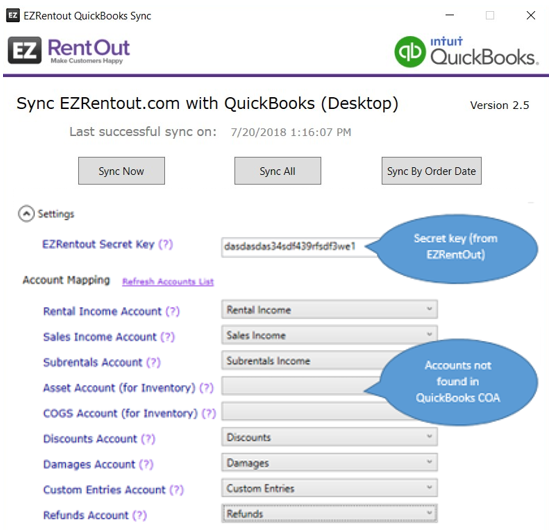 EZRentOut Sync is a Windows application that runs on your PC side by side with QuickBooks (desktop). This guide will walk through the process of installing and configuring EZRentOut Sync in a few easy steps. We will have you syncing your data with QuickBooks in no time! You will need the following to successfully install and run EZRentOut – QuickBooks Sync. An active ezrentout.com (subscription/trial) account. If you don’t have a subscription or trial account, register here. A PC with Windows 7 (all versions), Windows 8 (all versions) or Windows 10 (all versions). Hint: For a seamless installation process, it is recommended that you restart your PC before installing the EZRentOut Sync application. 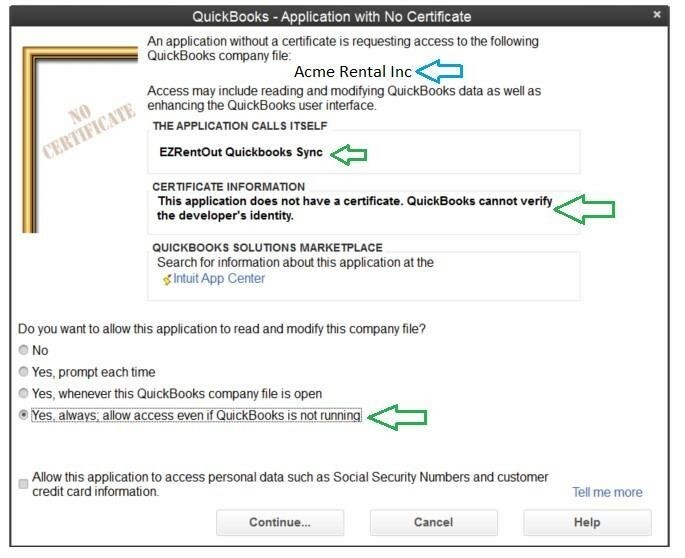 Important: If you do not have QuickBooks installed on your computer, it is important that you install it before attempting to install EZRentOut Sync. 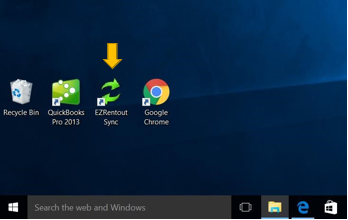 Hint: Due to known QuickBooks issues, it is recommended that you restart your PC before installing the EZRentOut Sync for a seamless installation process. Click here to download the latest EZRentOut Sync application zip file. Open the folder where you downloaded the zip file and extract its contents as shown below. The setup will install the EZRentOut Sync app and place application shortcut on the desktop and Programs Folder/Start Menu. The following screen shows the shortcut as they appear on a computer running Windows 10. Hint: You may simply click on either the shortcut on the desktop or launch EZRentOut Sync from Start -> Programs Menu. 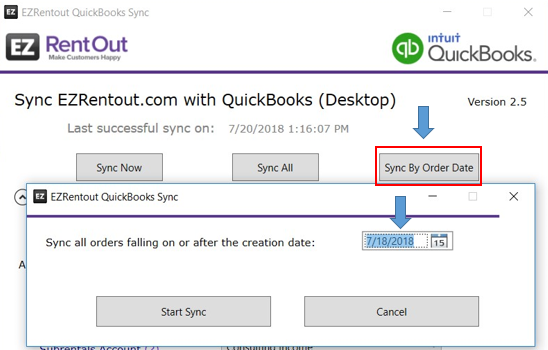 Before performing your first sync there are a few quick checks that you need to perform in QuickBooks to ensure that it is configured properly. If you collect taxes on orders in EZRentOut, it is required that Sales Tax should be enabled in QuickBooks as well. 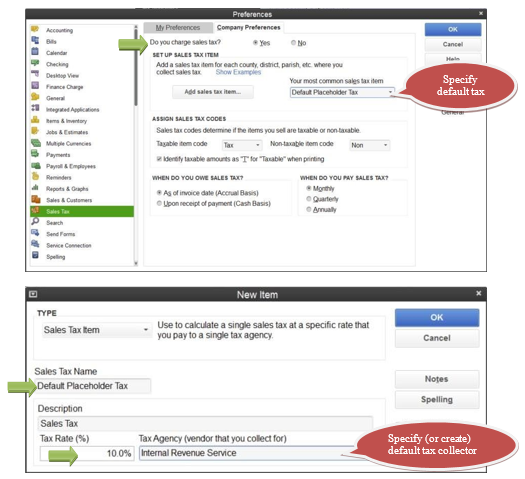 To do so, launch QuickBooks, load your company file and go to Edit >> Preferences >> Sales Tax (see image below). (Optional) If you are interested in tracking and viewing Fixed Assets synced from EZRentOut, enable the ‘Items and Inventory’ setting by going to Edit >> Preferences >> Items and Inventory as shown below. This step ensures that your account in the EZRentOut’s web application is ready for exchanging data with QuickBooks in a secure and private manner. Login to www.ezrentout.com using your admin username and password. Go to Menu on top-right of the page >> Settings >> Add Ons (see below). a. Select the Enabled option and click the Save button at the bottom of the page. b. The system will generate a secret key and display it for you (as shown in the image below). c. You will need this key, later on, to configure and authorize the EZRentOut Sync app to exchange data with your EZRentOut account. Hint: You could copy/paste the key into your favorite text editor to use later. Note: For this to work well, make sure to enable QuickBooks Desktop Integration as well in Settings > Add Ons > Integrate QuickBooks Desktop > Click ‘Enabled’. Once done, hit ‘Save Settings’ at the bottom of this page. Now launch QuickBooks and open the desired company file. (This is important, as QuickBooks needs to be running so that the EZRentOut Sync app can exchange data with it during the syncing process). Please note that Steps 3 & 4 are to be performed just once. You will be presented with the screen shown below. This screen enables you to grant permission to the EZRentOut Sync application to exchange data with QuickBooks. Proceed by selecting the options shown as shown below. Ignore the warning shown below, this is caused by the fact that the EZRentOut Sync isn’t assigned a digital signature yet since this is an early access release version of the application. This warning will go away in a subsequent update of the app. This will launch the EZRentOut Sync application (see image below). In the Settings section, enter your Secret Key generated in Step 3. In the Account Mapping section, select the QuickBooks account that you want to associate to your data in QuickBooks. Rental Income Account Income An account of type ‘Income’ to be associated with rental income. Sales Income Account Income An account of type ‘Income’ to record sales income. Sub Rentals Account Income An account of type ‘Income’ to record sub-rentals income. 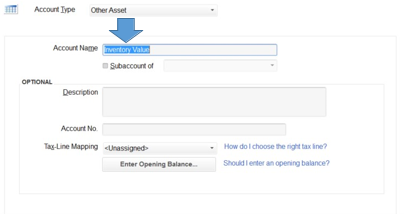 Asset Account (for Inventory) Other Asset An account of type ‘Other Asset’ used to record and track the value of current inventory items. COGS Account (for Inventory) Cost of Goods Sold An account of type ‘Cost of Goods Sold’ used to record the purchase cost of inventory. Discounts Account Income An account of type ‘Income’ to record discounts. Damages Account Income An account of type ‘Income’ to record damages. Custom Entries Account Income An account of type ‘Income’ to record custom entries. Refunds Account Income An account of type ‘Income’ to record refunds. Under Rules and Coupons, if a ‘Pricing Discount Coupon’ is set as ‘Charge’ category, then it will be synced to your ‘Custom Entries Account’ in QuickBooks Desktop. Moreover, if there are more than one ‘Pricing Discount Coupons’ created and the cumulative of those Pricing Discount Coupons (whether set as category ‘discount’ or ‘charge’ in EZRentOut) added to an order is in positive value, then it is also synced to your ‘Custom Entries Account’ in QuickBooks Desktop. However, if the value is in negative, then it is synced to your ‘Discounts Account’ in QuickBooks Desktop. Creating an Account That Doesn’t Exist in the System: The EZRentOut Sync application searches the QuickBooks Chart of Accounts (COA) and presents you with best-matched options. If, however, an account of a certain type does not exist in the COA, you will need to create it in QuickBooks. In the example below, the 4th and 5th fields are empty because no accounts of type ‘Asset‘ and ‘Cost of Goods Sold’ exists in the COA. 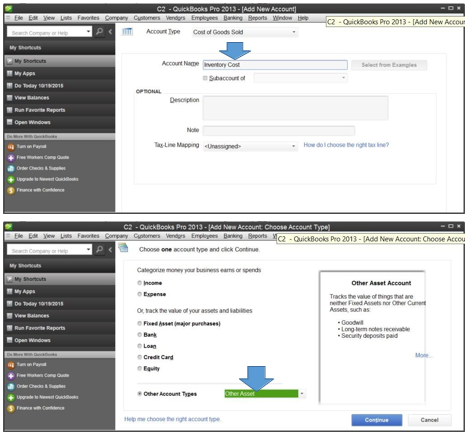 The following screens walk through the process of creating such (missing) accounts in QuickBooks. Go to Home >> Chart of Accounts >> Account >> New. Note: You can safely skip this and the next step if these accounts already exist in your case. After creating the accounts in QuickBooks, refresh the accounts list by clicking on ‘Refresh Accounts List’. The account list will be reloaded as shown below. Click on the Settings section to hide the settings (optional) and click the Sync Now button to launch sync. For details on all 3 sync options we offer, click here. Upon completion, you shall see the following on the application screen (indicating a successful sync session). Important: Since the application will remember all the settings, you will only need to launch the application and click the Sync Now/Sync All/Sync By Order Date button for subsequent sync operations. What Kinds of Data Do We Sync? It is important to note that payments made in either QuickBooks or EZRentOut will be synced over to the other platform. To learn how to avoid common errors when syncing payments, click here. Details other than payments (such as invoices, customers or taxes) are only pushed from EZRentOut to QuickBooks. Here is a list of the data we sync from EZR to Quickbooks. Sync all assets in EZR to fixed assets & service items in QuickBooks (including retired items). Sync all asset stocks in EZR to inventory & service items in QuickBooks (including retired items). Sync all inventory in EZR to inventory in QuickBooks (including retired items). 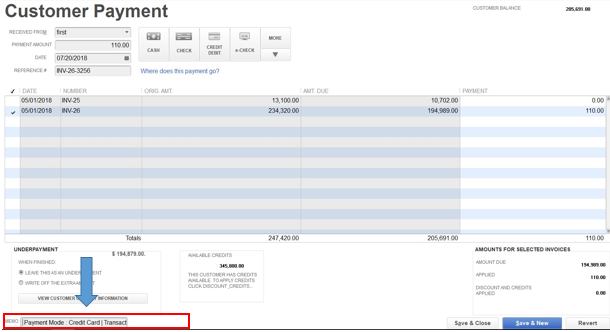 Sync all orders (with single tax applied) in EZR to invoices in QuickBooks. 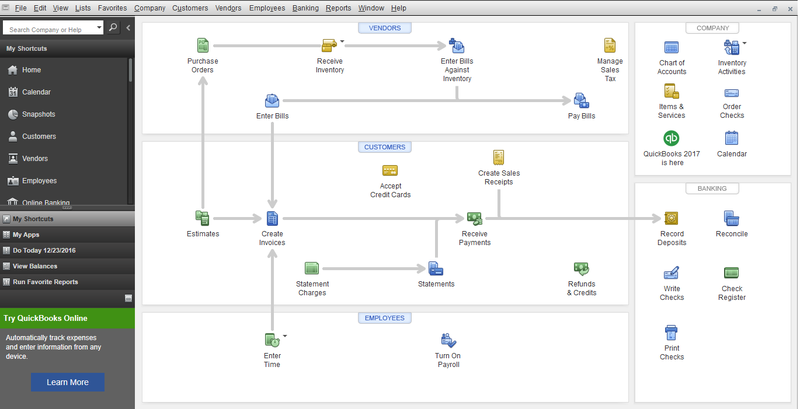 Sync all payments associated with orders in EZR to QuickBooks, and from QuickBooks to EZR. Sync Now: This enables you to sync all data created or modified since the last sync. The sync utility will always tell you when the last successful sync occurred. Sync All: This enables you to sync all data from your EZR account since inception. This might take some time if you have a considerable amount of items in EZR. Please note that this sync will override all corresponding data in QuickBooks, based on the data present in EZRentOut. Sync By Order Date: This enables you to sync only those orders from EZRentOut that fall on or after a specific date defined by you. This is useful in scenarios where you have updated an order in EZR for a specific date, and now need to sync it with QuickBooks Desktop. To reiterate, you can see the data we sync between each platform by referring to the section above. And with that, you’ve learned all you need to about syncing data between EZRentOut and QuickBooks. 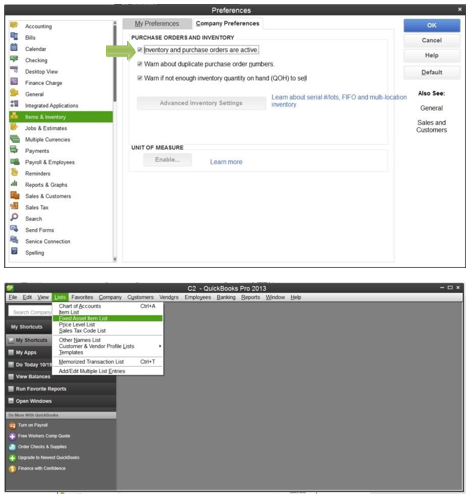 You can download the EZRentOut – QuickBooks Sync Utility here. This entry was posted in [Support], Getting Started, Integration, QuickBooks KB and tagged accounting, ezrentout app, integrations, Quickbooks, quickbooks desktop by admin. Bookmark the permalink.